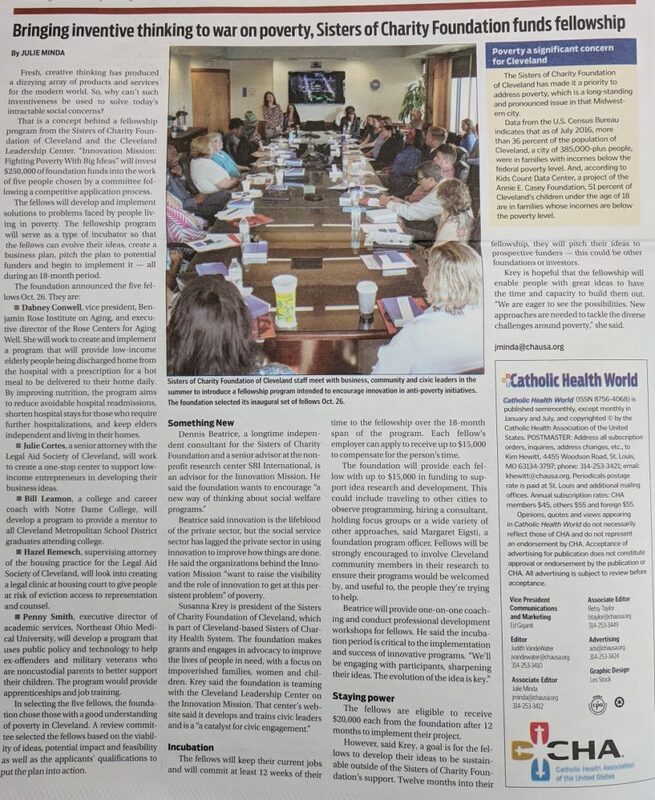 Catholic Health World published the following story about The Innovation Mission, a newly launched initiative from the Sisters of Charity Foundation to use innovation to disrupt the cycle of poverty. Fresh, creative thinking has produced a dizzying array of products and services for the modern world. So, why can’t such inventiveness be used to solve today’s intractable social concerns? That is a concept behind a fellowship program from the Sisters of Charity Foundation of Cleveland and the Cleveland Leadership Center. “Innovation Mission: Fighting Poverty With Big Ideas” will invest $250,000 of foundation funds into the work of five people chosen by a committee following a competitive application process. The fellows will develop and implement solutions to problems faced by people living in poverty. The fellowship program will serve as a type of incubator so that the fellows can evolve their ideas, create a business plan, pitch the plan to potential funders and begin to implement it — all during an 18-month period. Dabney Conwell, vice president, Benjamin Rose Institute on Aging, and executive director of the Rose Centers for Aging Well. She will work to create and implement a program that will provide low-income elderly people being discharged home from the hospital with a prescription for a hot meal to be delivered to their home daily. By improving nutrition, the program aims to reduce avoidable hospital readmissions, shorten hospital stays for those who require further hospitalizations, and keep elders independent and living in their homes. Julie Cortes, a senior attorney with the Legal Aid Society of Cleveland, will work to create a one-stop center to support low-income entrepreneurs in developing their business ideas. Bill Leamon, a college and career coach with Notre Dame College, will develop a program to provide a mentor to all Cleveland Metropolitan School District graduates attending college. Hazel Remesch, supervising attorney of the housing practice for the Legal Aid Society of Cleveland, will look into creating a legal clinic at housing court to give people at risk of eviction access to representation and counsel. Penny Smith, executive director of academic services, Northeast Ohio Medical University, will develop a program that uses public policy and technology to help ex-offenders and military veterans who are noncustodial parents to better support their children. The program would provide apprenticeships and job training. In selecting the five fellows, the foundation chose those with a good understanding of poverty in Cleveland. A review committee selected the fellows based on the viability of ideas, potential impact and feasibility as well as the applicants’ qualifications to put the plan into action. 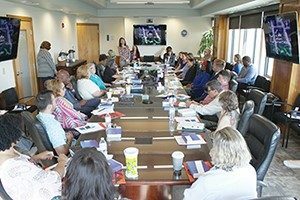 Pictured above: Sisters of Charity Foundation of Cleveland staff meet with business, community and civic leaders in the summer to introduce a fellowship program intended to encourage innovation in anti-poverty initiatives. The foundation selected its inaugural set of fellows Oct. 26. Beatrice said innovation is the lifeblood of the private sector, but the social service sector has lagged the private sector in using innovation to improve how things are done. He said the organizations behind the Innovation Mission “want to raise the visibility and the role of innovation to get at this persistent problem” of poverty. The fellows will keep their current jobs and will commit at least 12 weeks of their time to the fellowship over the 18-month span of the program. Each fellow’s employer can apply to receive up to $15,000 to compensate for the person’s time. The foundation will provide each fellow with up to $15,000 in funding to support idea research and development. This could include traveling to other cities to observe programming, hiring a consultant, holding focus groups or a wide variety of other approaches, said Margaret Eigsti, a foundation program officer. Fellows will be strongly encouraged to involve Cleveland community members in their research to ensure their programs would be welcomed by, and useful to, the people they’re trying to help. The fellows are eligible to receive $20,000 each from the foundation after 12 months to implement their project. However, said Krey, a goal is for the fellows to develop their ideas to be sustainable outside of the Sisters of Charity Foundation’s support. Twelve months into their fellowship, they will pitch their ideas to prospective funders — this could be other foundations or investors. Krey is hopeful that the fellowship will enable people with great ideas to have the time and capacity to build them out. “We are eager to see the possibilities. New approaches are needed to tackle the diverse challenges around poverty,” she said.